If you’ve ever had a wheel bearing call it quits on you halfway through a camping trip, I’m sure you’ll agree it’s a massive pain in the backside! The worst part is, they would have to be one of the most common components to fail out on the tracks. 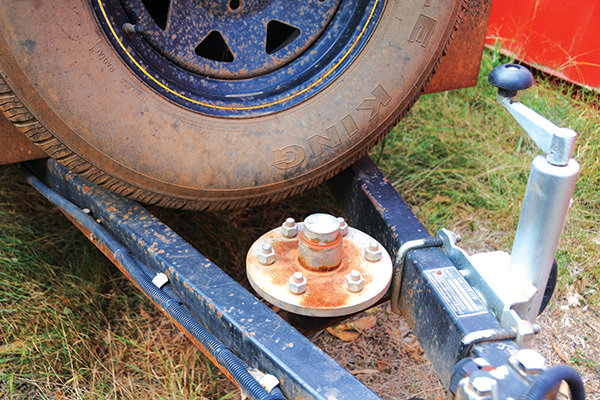 When you think about it, there really is a lot riding on them; not only do they help support the entire weight of your vehicle and trailer, they also play an absolutely crucial role in keeping your setup rolling. You can have a canvas weaved with unicorn hair, but if a wheel bearing goes bang, you go nowhere. So, it makes sense to get a better understanding of how these little buggers, or should I say beauties, actually work. So break out the fine wine and hold on to your hats, the next few pages could save you some precious time and money in the long run. Your wheel bearings are buggered, mate! That’s usually about as technical as any explanation of a failed wheel bearing gets these days. But, what actually fails? And how do you ensure it doesn’t happen again? Well, let’s start by saying the less friction there is, the easier it is for an object to move. It’s easier to roll a tyre than to slide or drag it along the road, right? 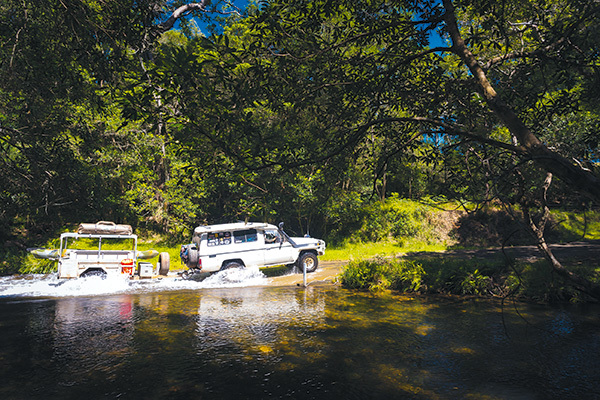 When it comes to the tyres on your 4WD and camper, you need them to spin independently to the rest of the set-up without much friction at all. A wheel bearing’s main purpose is to reduce friction and allow opposing objects to roll, rotate or slide easier and without damage. They do this by using smooth metal rollers or balls to ‘bear the load’, which sit between a smooth inner and outer metal race/surface with some sort of lubricating grease or oil thrown in the mix. Most if not all wheel bearing failures can be put down to an increased amount of friction, which causes a build-up of heat capable of melting, distorting, cracking and fatiguing the metal components – not fun at all! This excess friction is usually caused by a lack of lubrication; things like an insufficient amount of grease, or even unsuitable or contaminated grease which has lost its lubricating properties, are the main culprits. Too much load placed on the bearings will do it, too. It’s a bit like strapping an object down to the back of the ute; the tighter you pull down, the harder it is to move. On most buggered bearings you’ll find physical damage like etching, scuffs, chips and scouring on the rollers and races, but when they really go bang, we’ve seen them melt to the stub axle, seize up and literally snap the stub axle clean off. 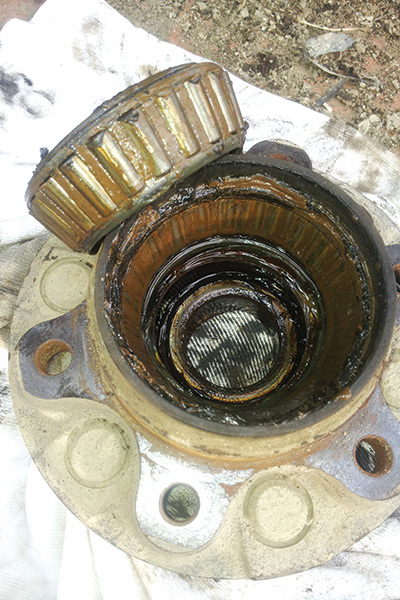 Signs of contaminated grease include caked up clumps, discolouration or any sign of moisture. Excessive heat won’t be too far behind poor bearing grease, either. If a hub assembly gets too hot to touch comfortably, it’s a good indication there’s a problem. Grease leaking out on to the rim is another tell-tale sign, which is usually accompanied by steam if it gets hot enough. It’s also worth jacking the wheels up before a trip away and checking for free-play by wriggling the wheel from top to bottom. Also, if you spin the wheel it should rotate nice and smoothly with minimal drag providing the brakes are loosened up a bit of course. Grinding or whirling noises definitely warrant further investigation, although sometimes the brake assembly can be the cause of this one. If the hub assembly has got really hot in the past for some reason, it’s worth replacing the bearings as the metal integrity may have already been compromised. Also, have a good hard look at the stub axle for hairline fractures or cracks, especially on the underside and around any steps machined into the metal. Catching this early could save you a headache. As the saying goes, prevention is better than cure, so don’t slack off on your wheel bearing maintenance, eh? 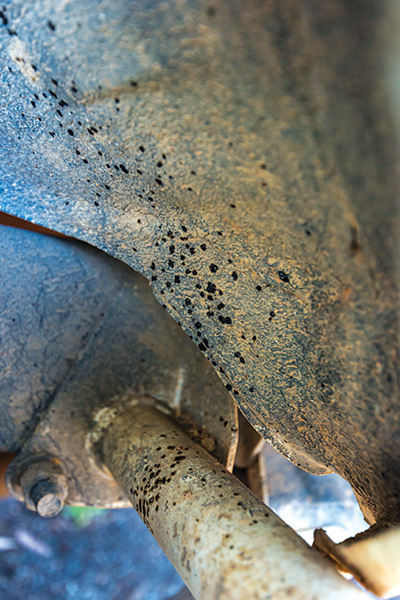 For us offroad lovers, the lines are blurred as to how often we should be repacking our bearings with fresh grease or replacing them altogether. But as a general rule of thumb, it’s good practice to do them every 12 months under regular driving conditions, and if you’re rough on the gear, check them before and after every trip. If the bearings are getting loose and creating free-play, it’s a good indication they’re past their use-by date. 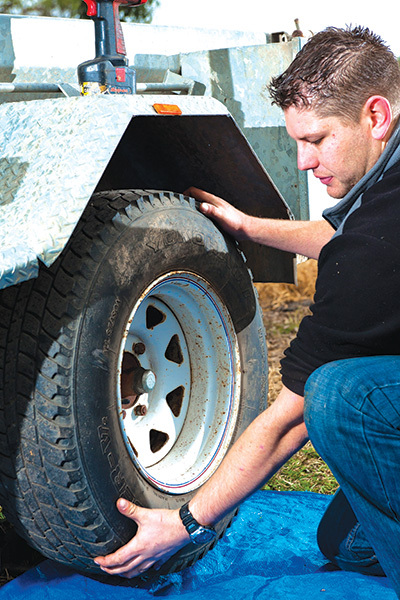 Travelling without a set of spare bearings for your camper trailer is just plain silly. But you know what’s even sillier? Carrying the wrong ones! Trust us, it happens. So double check you’ve got the right ones on board. 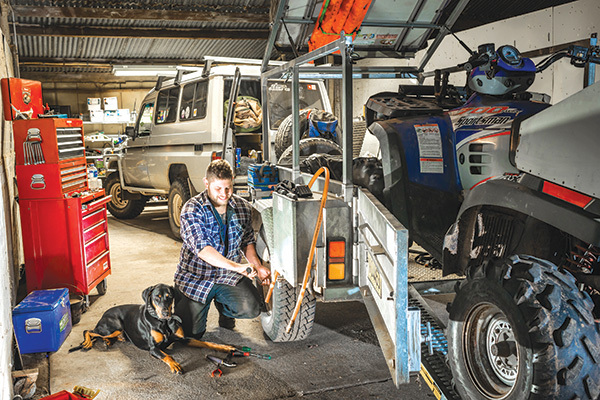 The next important step is to make sure the spares are sealed up properly as they’re likely to see plenty of dust and water during your travels which can render them useless before you’ve even used them. The funny thing is, unless you catch a buggered bearing early, there’s a big chance it’ll destroy more than just the bearing itself. The hub and stub axle usually cop it, too. 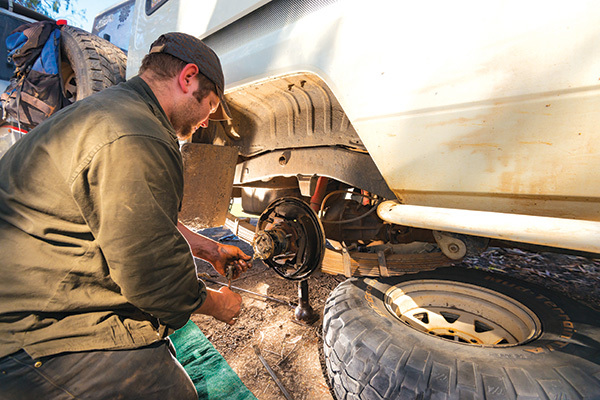 So, if you’re planning to travel to remote spots, do yourself a favour and pack a complete spare hub. Obviously, you’ll need a fresh tub of grease on board and a couple of spare split pins can be very useful as well. In a breakdown situation sourcing replacement parts is usually the hardest, most time consuming part. If you’ve got them onboard you’re already a few steps ahead. A top idea is to weld a spare stub axle in place and mount an entire spare hub to it so it’s all there ready to go. Make it part of your routine to check the wheel bearings every time you stop for fuel. You don’t have to pull them apart, just have a quick look for any visual signs like grease spray on the rim or too much heat. It’s also good to do a basic check for free-play by grabbing the top of the tyre and pulling it back sharply towards you with a fair bit of oomph – you’ll know when it’s loose! With regular servicing and check ups, there’s no reason for a wheel bearing to be the bearer of bad news on your next offroad escape. Give them plenty of respect and a little bit of lovin’ to keep your backside trackside!